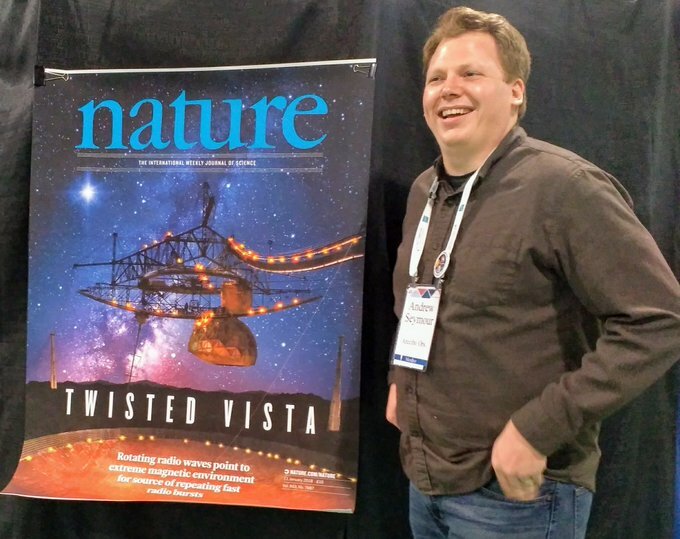 Using the Arecibo Observatory in Puerto Rico and the Green Bank Telescope in West Virginia, a team from Universities Space Research Association (USRA) and other institutions today announced today at the American Astronomical Society’s winterAAS meeting that mysterious bursts of radio emission, called Fast Radio Bursts (FRB), may be coming from near a giant black hole. Scientist Andrew Seymour was co-author of the newly released results of FRB 121102. Fast Radio Bursts are a strong and very short flash of radio waves first identified in 2007 using archival data obtained in 2001. Interestingly, most of the bursts have not been observed again, with the exception of one. “FRB121102 was found to repeat and is the only known FRB source to do so”, noted Dr. Andrew Seymour, an Astronomer with the Universities Space Research Association (USRA) at Arecibo Observatory. “Even then, no pattern to the bursts have been identified, unlike with other radio phenomena, such as pulsars”, continued Dr. Seymour. Though how FRBs are produced remains a mystery, astronomers last year confirmed that at least one of the bursts, FRB121102, which was first discovered at the Arecibo Observatory, originated from beyond our galaxy at a distance of 3 billion light years from Earth. “Over 100 million times the energy produced by the sun in an entire day would be needed to power a burst reaching the Earth from this distance that only lasted a few seconds”, noted Dr. Robert Minchin, Astronomer with USRA and group lead for Radio Astronomy at Arecibo Observatory. Using new observations at higher frequencies, the team has now discovered the bursts from FRB121102 may be coming from an extreme environment, like near a giant black hole. “We developed a new observing setup at the Arecibo Observatory to do this, and our colleagues at the Green Bank Telescope confirmed the results with observations at even higher radio frequencies,” said Dr. Seymour. “What’s more, one of the bursts we detected lasted less than 30 microseconds. Such a short duration argues that the bursts originated from a neutron star in an extreme environment of magnetized plasma”, he added. These higher frequency observations allowed the astronomers to study the polarization of the radio waves, and they discovered that they were being “twisted” by a very strong magnetic field in a process known as Faraday rotation. One explanation for this is that FRB121102 is close to a massive black hole in its own host galaxy, an environment similar to that seen in the center of our own Galaxy, or in another extreme environment such as a powerful nebula or a supernova remnant. Because FRB121102 is the is the only known repeating FRB, many have speculated that it might have a different origin from the non-repeating FRBs. “FRB 121102 was already unique because of its repetition; now the huge Faraday rotation we have observed singles it out yet again. We’re curious as to whether these two unique aspects are linked,” said Daniele Michilli, PhD candidate at the University of Amsterdam, and discoverer of the polarization of FRB121102. “This discovery demonstrates the power of the Arecibo and Green Bank telescopes, and why they remain vital parts of the U.S. astronomical portfolio”, said Dr. Joan Schmelz, USRA Director and Deputy Director of Arecibo Observatory. “We look forward to continuing to work with the FRB team as they monitor this source in the future”, continued Dr. Schmelz. This ongoing monitoring will distinguish between the two leading hypotheses – either a neutron star near a black hole, or one embedded in a powerful nebula – or possibly other, more exotic interpretations, by monitoring how the “twisting” and other properties of the bursts change with time. Founded in 1969, under the auspices of the National Academy of Sciences at the request of the U.S. Government, the Universities Space Research Association (USRA) is a nonprofit corporation chartered to advance space-related science, technology and engineering. USRA operates scientific institutes and facilities, and conducts other major research and educational programs, under Federal funding. USRA engages the university community and employs in-house scientific leadership, innovative research and development, and project management expertise. More information about USRA is available at [www.usra.edu].